The Indonesian Scholarship and Research Support Foundation (ISRSF) invites talented young Indonesian graduates holding at least an S1 degree to apply for the 2015 Arryman Fellows award. This award is an innovative “1+6” educational scholarship leading to a doctorate in the social sciences. During the first year, Arryman Fellows are funded to be in residence at Northwestern University in Chicago (USA) as pre-doctoral researchers. Fellows take graduate classes for credit in their chosen field of study, develop their English language skills, and write a major research paper. ISRSF seeks applicants especially in the fields of history, political science, sociology, development studies, academic law, communication studies, and anthropology. Late in the first year, Arryman Fellows apply to a Northwestern Ph.D. program. 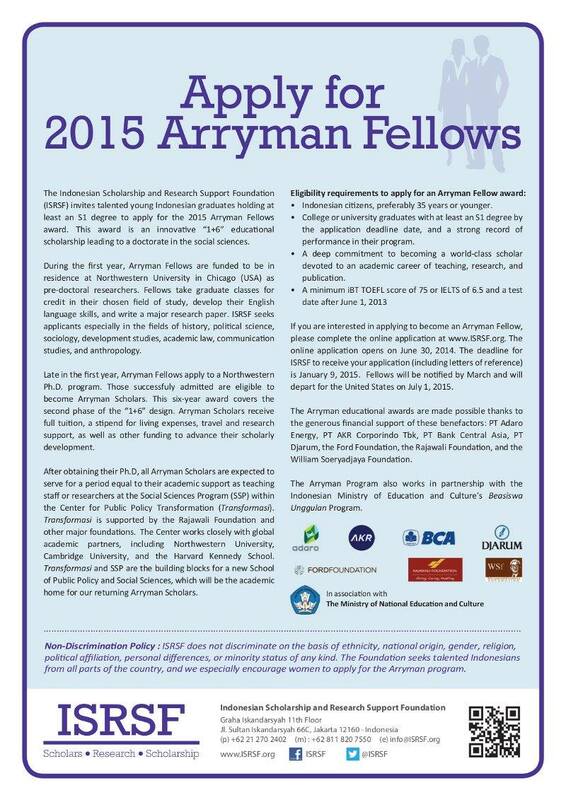 Those successfully admitted are eligible to become Arryman Scholars. This six-year award covers the second phase of the “1+6” design. Arryman Scholars receive full tuition, a stipend for living expenses, travel and research support, as well as other funding to advance their scholarly development. After obtaining their Ph.D., all Arryman Scholars are expected to serve for a period equal to their academic support as teaching staff or researchers at the Social Sciences Program (SSP) within the Center for Public Policy Transformation (Transformasi). Transformasi is supported by the Rajawali Foundation and other major foundations. The Center works closely with global academic partners, including Northwestern University, Cambridge University, and the Harvard Kennedy School. Transformasi and SSP are the building blocks for a new School of Public Policy and Social Sciences, which will be the academic home for our returning Arryman Scholars. • Indonesian citizens, preferably 35 years or younger. • College or university graduates with at least S1 degree by the application deadline date, and a strong record of performance in their program. • A deep commitment to becoming a world-class scholar devoted to an academic career of teaching, research, and publication. If you are interested in applying to become an Arryman Fellow, please complete the online application at www.ISRSF.org. The online application opens on June 30, 2014. The deadline for ISRSF to receive your application (including letters of reference) is January 9, 2015. The Arryman educational awards are made possible thanks to the generous financial support of these benefactors: PT Adaro Energy, PT AKR Corpindo Tbk, PT Bank Central Asia, PT Djarum, the Ford Foundation, the Rajawali Foundation, and the William Soeryadjaya Foundation. The Arryman program also works in partnership with the Indonesian Ministry of Education and Culture’s Beasiswa Unggulan Program.